In Chiapas México, the climate is usually warm and humid, but at 1’400 meters high, on the slopes of the Tacaná volcano, the wind is cold. In the middle of that climate, on a land rich in volcanic minerals, the communities of Eureka, Alpujarras, Las Nubes, Monte Cristo and Talquián among others, devote their lives to coffee farming. The skin of the cherry was mostly used as fertilizer, and it often became waste that ran downstream, contaminating the water it touched. However, now that bittersweet fruit —sun-dried for 5 days— is used to prepare a unique, energizing and refreshing infusion called “Cáscara”. Year after year, harvest after harvest, the production process is repeated unalterably. The coffee farmer places coffee cherries in water and only selects the mature ones, after which a machine separates the fruit from its seeds. Only the finest and ripest fruit will make its way into Tlako’s Cáscara beverages. In addition to refining their farming processes, thus increasing their profitability and earnings, these communities are generating a further income through the production of cáscara. Hence, these families evolved from finding solutions to manage waste, to a new source of revenue. 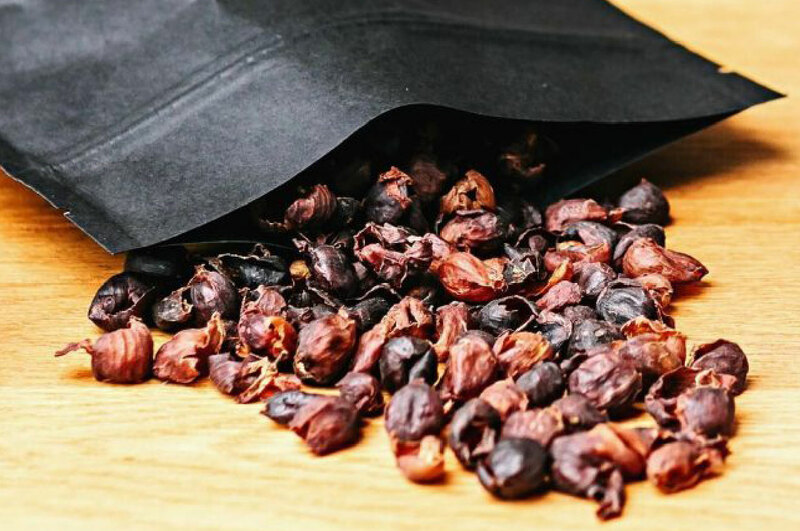 By mixing our cáscara (coffee cherry husk) and hot water for a few minutes, you will discover a vibrant, fruity, slightly acid, and sweet infusion. Since the process of drying the pulp of the coffee cherry generates an enhancement in flavor and sugar concentration, the taste of this exciting drink evolves accordingly to its temperature. Served cold, warm or hot, this beverage also serves as an energetic drink due to its high content of caffeine. TLAKO has been working on this project since 2015 and we’re proud and happy to share it as a drink in different manners in the restaurant (e.g. tea, cocktails, refreshments), or in our retail section for you to prepare at home and enjoy it with family and friends.